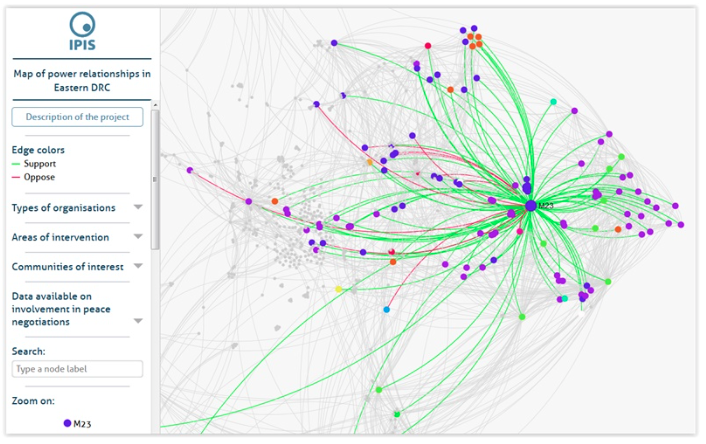 IPIS has developed an interactive tool to map and visualize power dynamics in conflict and post-conflict areas. The tool can be used to describe local, provincial, national, regional and international peace builders and spoilers and the relationships between these actors. The tool is a visual representation of a table created by IPIS researchers during their study. Visualisation is created by gathering data and coding data obtained through interview and literature review. A power mapping visualisation tool and table can help non-governmental and governmental actors understanding the underlying dynamics of a conflict or post-conflict situation. Due to the nature of the data and the specific use of the tool, this particular power mapping is not publicly available and can not be shared readily. However, IPIS welcomes requests for power mapping projects tailored to your needs… Please contact us for more information. The IPIS Power Mapping Tool was built with the support of Atelier Iceberg and Clément Levallois.